Summary: An oddity of the New America is how we stumble when dealing with problems solved not just by our peers in other developed nations, but in our past. Gun control is but one example. Other nations, our peers in the developed world, have accomplished what we’re told is impossible for Americans: reducing gun ownership. In our past we were able to regulate guns without cries that we shredded the Constitution (the subject of today’s post). In brief, we see ignorance and amnesia — what conservative leaders consider ideal qualities for citizens. As shown in Myth-busting about gun use in the Wild West, the untamed late 19th century West was relatively peaceful — except for institutional violence (eg, against Indians, small farmers and ranchers, unions). Laws regulating gun possession helped make it so. The people who opened the frontier were not dumb, and didn’t want their streets running with blood. Nor were the citizens of Americans during the following century, in which many areas had strict gun controls. This history has been erased from the minds of millions through the power of propaganda on a willing audience. It’s become lost history, joining so much of our 19th century in the amnesic clouds of the American mass mind. But the truth is out there, as in these two excerpts, if only we have the will to grasp it. Fear these people. That’s why many Western towns banned guns. When Dodge City residents organized their municipal government, do you know what the very first law they passed was? A gun control law. 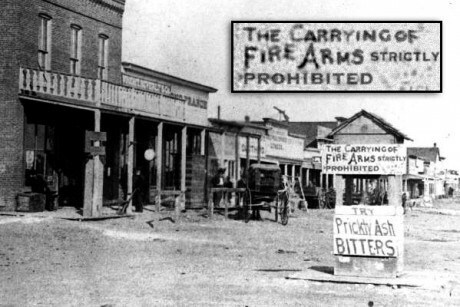 They declared that “any person or persons found carrying concealed weapons in the city of Dodge or violating the laws of the State shall be dealt with according to law.” Many frontier towns, including Tombstone, Arizona — the site of the infamous “Shootout at the OK Corral” — also barred the carrying of guns openly. Today in Tombstone, you don’t even need a permit to carry around a firearm. Gun rights advocates are pushing lawmakers in state after state to do away with nearly all limits on the ability of people to have guns in public. As early as 1876, Dodge City had a ban on carrying guns on the north side of town (the south side remained wide open), a ban that was rarely enforced. However, by 1883 the death toll from gun play had risen sufficiently for the town fathers to enact a stricter ban. 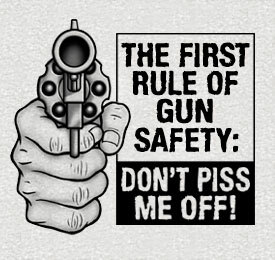 It is hereby declared to be unlawful for any person to carry deadly weapons, concealed or otherwise [except the same be carried openly in sight, and in the hand] within the limits of the City of Tombstone. This prohibition does not extend to persons immediately leaving or entering the city, who, with good faith, and within reasonable time are proceeding to deposit, or take from the place of deposit such deadly weapon. All fire-arms of every description, and bowie knives and dirks, are included within the prohibition of this ordinance. On display at the Red Dog Saloon in Juneau; from Wikimedia Commons. Click to enlarge. Previous Post Do guns make us more safe, or less? Let’s look at the research.